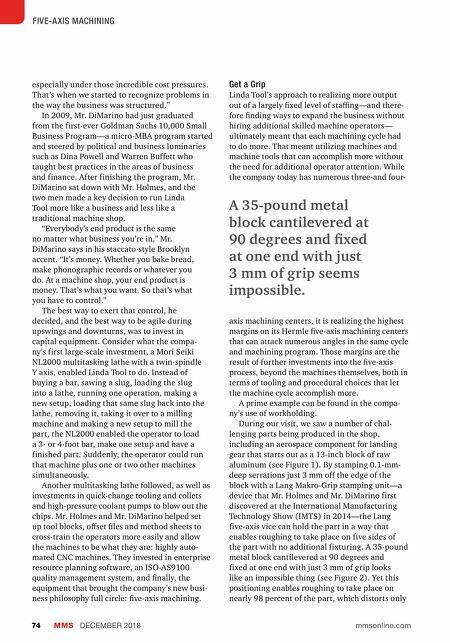 MMS DECEMBER 2018 74 mmsonline.com FIVE-A XIS MACHINING especially under those incredible cost pressures. That's when we started to recognize problems in the way the business was structured." In 2009, Mr. DiMarino had just graduated from the first-ever Goldman Sachs 10,000 Small Business Program—a micro-MBA program started and steered by political and business luminaries such as Dina Powell and Warren Buffett who taught best practices in the areas of business and finance. After finishing the program, Mr. DiMarino sat down with Mr. Holmes, and the two men made a key decision to run Linda Tool more like a business and less like a traditional machine shop. "Everybody's end product is the same no matter what business you're in," Mr. DiMarino says in his staccato-style Brooklyn accent. "It's money. Whether you bake bread, make phonographic records or whatever you do. At a machine shop, your end product is money. That's what you want. So that's what you have to control." The best way to exert that control, he decided, and the best way to be agile during upswings and downturns, was to invest in capital equipment. Consider what the compa- ny's first large-scale investment, a Mori Seiki NL2000 multitasking lathe with a twin-spindle Y axis, enabled Linda Tool to do. Instead of buying a bar, sawing a slug, loading the slug into a lathe, running one operation, making a new setup, loading that same slug back into the lathe, removing it, taking it over to a milling machine and making a new setup to mill the part, the NL2000 enabled the operator to load a 3- or 4-foot bar, make one setup and have a finished part. Suddenly, the operator could run that machine plus one or two other machines simultaneously. Another multitasking lathe followed, as well as investments in quick-change tooling and collets and high-pressure coolant pumps to blow out the chips. Mr. Holmes and Mr. DiMarino helped set up tool blocks, offset files and method sheets to cross-train the operators more easily and allow the machines to be what they are: highly auto- mated CNC machines. They invested in enterprise resource planning software, an ISO-AS9100 quality management system, and finally, the equipment that brought the company's new busi- ness philosophy full circle: five-axis machining. 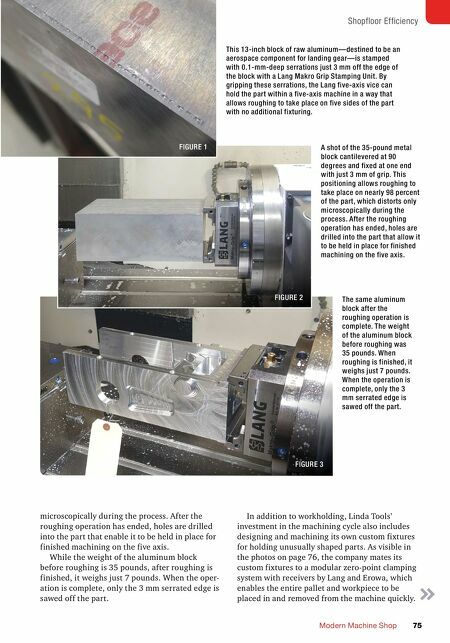 Get a Grip Linda Tool's approach to realizing more output out of a largely fixed level of staffing—and there- fore finding ways to expand the business without hiring additional skilled machine operators— ultimately meant that each machining cycle had to do more. That meant utilizing machines and machine tools that can accomplish more without the need for additional operator attention. While the company today has numerous three-and four- axis machining centers, it is realizing the highest margins on its Hermle five-axis machining centers that can attack numerous angles in the same cycle and machining program. Those margins are the result of further investments into the five-axis process, beyond the machines themselves, both in terms of tooling and procedural choices that let the machine cycle accomplish more. A prime example can be found in the compa- ny's use of workholding. During our visit, we saw a number of chal- lenging parts being produced in the shop, including an aerospace component for landing gear that starts out as a 13-inch block of raw aluminum (see Figure 1). By stamping 0.1-mm- deep serrations just 3 mm off the edge of the block with a Lang Makro-Grip stamping unit—a device that Mr. Holmes and Mr. DiMarino first discovered at the International Manufacturing Technology Show (IMTS) in 2014—the Lang five-axis vice can hold the part in a way that enables roughing to take place on five sides of the part with no additional fixturing. A 35-pound metal block cantilevered at 90 degrees and fixed at one end with just 3 mm of grip looks like an impossible thing (see Figure 2). Yet this positioning enables roughing to take place on nearly 98 percent of the part, which distorts only A 35-pound metal block cantilevered at 90 degrees and fixed at one end with just 3 mm of grip seems impossible.